'The war tried to kill us in the spring.' So begins this powerful account of friendship and loss. In Al Tafar, Iraq, twenty-one-year old Private Bartle and eighteen-year-old Private Murphy cling to life as their platoon launches a bloody battle for the city. Bound together since basic training when Bartle makes a promise to bring Murphy safely home, the two have been dropped into a war neither is prepared for. In the endless days that follow, the two young soldiers do everything to protect each other from the forces that press in on every side: the insurgents, physical fatigue, and the mental stress that comes from constant danger. As reality begins to blur into a hazy nightmare, Murphy becomes increasingly unmoored from the world around him and Bartle takes actions he could never have imagined. 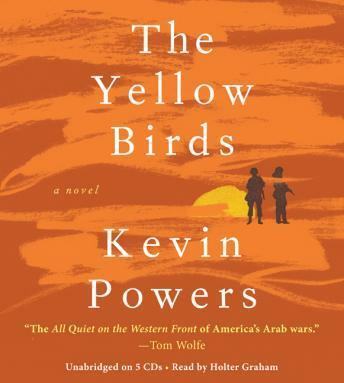 With profound emotional insight, especially into the effects of a hidden war on mothers and families at home, The Yellow Birds is a groundbreaking novel that is destined to become a classic. I loved this book. I heard an interview on OPB, so I thought I'd try it, but didn't really know what to expect. I was surprised by how I connected with the speaker and cared about him.